Some people think it's a strategic mistake for prominent Democrats to try to make Rush Limbaugh the leader of the Republican Party. A few of the reasons: 1) The controversy lines Limbaugh's pockets; 2) The controversy increases the number of minds poisoned by Limbaugh's vitriol; 3) Limbaugh benefited enormously after the Clinton White House took him on. Some of these things are undoubtedly happening. More people are listening to Limbaugh and some of those people who started to listen will become "ditto-heads." However, the benefits of making Limbaugh the face of the GOP outweigh any disadvantages. Before I discuss the overwhelming benefits, I'll first discuss why the Clinton administration failed and why Democrats and progressive now will succeed. When Bill Clinton won the 1992 presidential election, the response by Limbaugh and other talk radio jocks was swift and decisive: Limbaugh and the various Rush clones went on the warpath. When Deputy White House Counsel Vince Foster committed suicide in 1993, Limbaugh and talk radio were an integral part of what journalist Trudy Lieberman called "the Vince Foster Factory," a group of prominent right-wing media people who were putting forth conspiracy theories that Bill and Hillary were responsible for Foster's death (years after several investigations debunked the right's theories, Limbaugh has continued to act as if the Clintons had murdered Foster). How did the Clinton administration respond to this wing-nut onslaught? They put Lanny Davis on it. The Clinton administration didn't know what hit it. That's understandable but they did very little to counter the media wing-nuts. In fact, during the 1990's, the only effective hits on Limbaugh were by Fairness and Accuracy in Reporting and a former Saturday Night Live writer, but these efforts were too little, too late. The Clinton administration's fecklessness and ineptitude are no big surprise. I have written about how the Clintons dealt with the Unification movement (here and here). 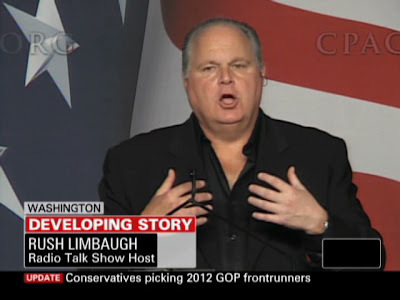 It also didn't help that much of the mainstream media has been clueless about Limbaugh (e.g., here and here). The year 2009 is a lot different from 1993. For one thing, in 1993, the right had a powerful media apparatus and noise machine and progressives were way behind (for a discussion of this inequality, read Robert Parry's thoughtful analysis). That has changed since 2000. A few quick reasons: 1) The emergence of Media Matters for America in 2004. In the 1990's Limbaugh benefited because there was no paper trail because people weren't recording and transcribing Limbaugh's radio show. When I started this blog, I listened to Limbaugh and transcribed many outrageous things Limbaugh said (e.g., a racist parody commercial that Limbaugh aired). When Media Matters was established, its staff could not only monitor Limbaugh's radio show, but they had the ability to monitor Hannity, Savage, O'Reilly and other right-wing talkers. 2) The rise of the progressive blogosphere. 3) The rise of progressive commentators such as Keith Olbermann, Rachel Maddow and the increase in popularity of Jon Stewart and Stephen Colbert. Sure, there has been a recent increase in listeners but also an increase in people researching Limbaugh on the Internet. As I have pointed out, the net is the bane of movements and people who seek to control others. The more people who research Limbaugh on the net, the more people dislike him. It also doesn't help Limbaugh that in the past few years,the following have occurred: 1) Limbaugh problems with hillbilly heroin have emerged; 2) Wife Number 3 left Limbaugh; 4) The infamous mocking of Michael J. Fox's Parkinson's symptoms became a national story. The upshot is that the more Americans know about Limbaugh, the less they like him, namely because he is an unlikable person. As Ruy Texiera and John B. Judis pointed out a few years ago, demography favors the Democrats. The GOP has depended on the Southern strategy to become a white Southern party. The US is increasingly becoming a non-white society; the GOP has overplayed its hand and has become, to use the words of Zell Miller, "a national party no more." There's a strong generational component also. The real and latent bigotry as well as the terminal unhipness of the Republican right has made Limbaugh and the GOP anathema to younger voters. To an 18 to 30-year-old, Limbaugh must seem like the oldest man in the world. Polling research by Stanley Greenberg indicated that Limbaugh had an approval rating among American younger than 40 of 11 percent. Eleven percent! Having Limbaugh as the face of the GOP will accelerate the party's "death spiral." Right-wing talk radio is a vast wasteland. An example of this is the 3 to 6 PM EST weekday time slot . 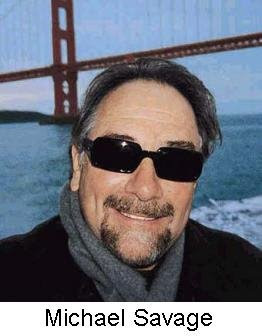 The radio hosts with the largest audiences are Michael Savage (née Weiner) and Mark Levin. Both Savage and Levin are raging lunatics (I had written about Savage when his first political book came out--also here). Don't believe me: listen to these two men rant on their radio shows. For instance, today on their radio shows, Savage called President Obama as a "dictator in the making" and Levin referred to Media Matters and similar progressive groups as "brownshirts." The recent Limbaugh controversy is great not only for the reason I've listed but because it is dividing the hard right. Some rational right-wingers like David Frum are being attacked not only by Limbaugh but by other wing-nuts such as Levin. The other day, Frum, who has written a couple scathing articles about the campaign to elevate Limbaugh as the nominal leader of the GOP, responded to attacks by Levin by calling the show--listen to the call here--it's priceless. Also, having a unhinged wing-nut like Savage being the third most influential radio talk show host is great for dividing the right because less rabid right-wingers know what a nut Savage is (though it amuses me to no end that an unhinged Levin routinely attacks Savage as a nut). A case in point, before George W. Bush left office in January, he invited several prominent right-wing radio hosts for a meeting in the White House. According to radio host Neal Boortz, when the radio hosts were together before Bush arrived, one topic of discussion among the hosts was how Savage will sooner rather than later "implode." It's fun when they eat their own. UPDATE I: Just a few more thoughts on Limbaugh. David Frum's description of Limbaugh ("A man who is aggressive and bombastic, cutting and sarcastic, who dismisses the concerned citizens in network news focus groups as “losers.” With his private plane and his cigars, his history of drug dependency and his personal bulk, not to mention his tangled marital history, Rush is a walking stereotype of self-indulgence") is spot on. I've listened to Limbaugh since first hearing about him when 60 Minutes did a story on him. Limbaugh has a huge ego (that obviously he uses to try to mask his massive insecurities). That ego has been bad for the GOP. It's hilarious when we watch Michael Steele and other prominent Republicans apologize and grovel before Limbaugh, but more importantly, it reinforces the view that the modern Republican Party is a cult of fear in which people like Harry Whittington and John Dilulio are forced to apologize when they did nothing wrong. . . The essence of the post was to underscore how the media rules of the Clinton years don't apply now. During the Clinton years, mainstream journalists were either cowed or looked the other way when Limbaugh pushed his Vince Foster conspiracy theories or made racist comments. With Media Matters, The Daily Show, the blogosphere, and MSNBC, Limbaugh is, at long last, accountable for what he says due to prominent commentators who review what he says. Not only that, but he's becoming increasingly accountable for what he has said in the past. There are now consequences for what Limbaugh says. UPDATE II: TPM has more on Stanley Greenberg's survey research on Limbaugh. One key point of the survey research: although Limbaugh is overwhelmingly unpopular with Americans, 63 percent of Republicans think Limbaugh has too little or the right amount of influence over the Republican Party. Sam Stein has more analysis of the polling data. UPDATE III: Eating their own update. I don't regularly listen to either Mark Levin's or Michael Savage's radio shows. Before I wrote this post, I knew they were not just competitors but two men who hated each other. 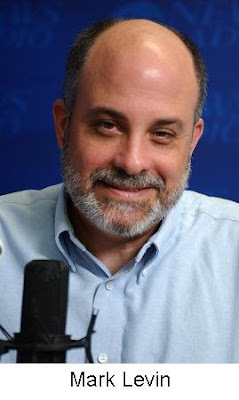 I've never heard Savage slam Levin on his radio show but I have heard Levin rub it in concerning media markets in which his show has higher ratings than Savage's. Levin also refers to Savage's show not as "Savage Nation" but "Weiner Nation." I just did a little googling and found some hilarious stuff. This YouTube video has Savage doing an apoplectic rant (go to about 3:00 on the video). Here's another video slam of Levin. UPDATE IV: With the help of Drudge, Hannity, Malkin and other members of the right's media infrastructure, Mark Levin's book Liberty and Tyranny: A Conservative Manifesto is now ranked #1 on Amazon.com. UPDATE V: Michael Alan Weiner (also known as Michael Savage), along with others such as Amir Siddique and Fred Phelps, are banned from Great Britain.